last December i created a sparkled dipped mani for the holiday season. now that spring is here, how about a sparkle dipped pedi? i'm one of those girls who likes to use sparkle on the regular when it comes to my pedi. 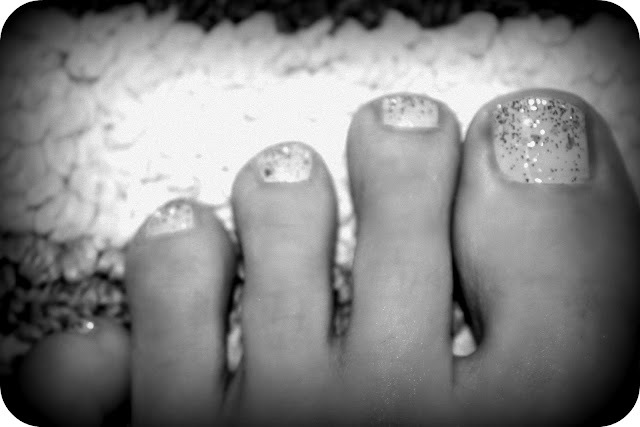 i'm not a big fan of sparkle makeup, and sparkle-y fingernails are great for special occassions, but sparkle toes just make me happy. don't forget to visit Allure's Beauty Blogger Awards. the first challenge is up today and i could use your vote. remember, every vote is an entry from amazing rewards from Allure, as well as enters you into my weekly giveaway (just leave me a comment on the giveaway post). I need to try this what is the nail polish color name?? CUTE!!! I love sparkles and now I have a new way to use them!! Who'da thunk to apply in layers like this!!! Thanks for the tip!